I met Rabbi Danya Ruttenberg through her writing on modesty. Her voice made so much common sense and I found her thoughts at once inspirational and comforting. For those of you unfamiliar with Danya Ruttenberg, she is a Rabbi and author of Nurture the Wow: Finding Spirituality in the Frustration, Boredom, Tears, Poop, Desperation, Wonder, and Radical Amazement of Parenting–-a National Jewish Book Award finalist and PJ Library Parents’ Choice selection–and six other books, including Surprised By God: How I Learned to Stop Worrying and Love Religion. 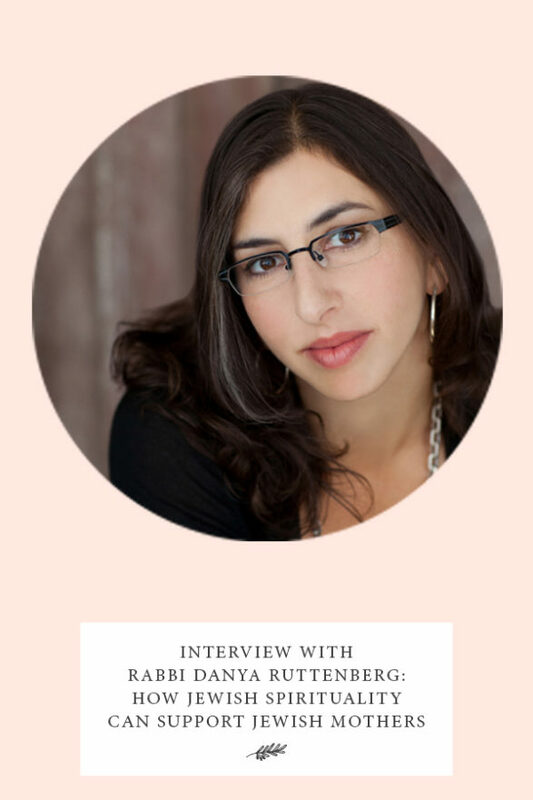 She has written for the New York Times, The Atlantic, The Washington Post, and Time, was named as a “rabbi to watch” by Newsweek and one of the top 50 women rabbis by the Forward, and serves as Rabbi-in-Residence at Avodah. You can learn more about her work at danyaruttenberg.net, find her on Facebook and follow her on Twitter @TheRaDR. It’s with great honor (and excitement!) that I share this interview with Rabbi Danya Ruttenberg. Tell us a bit about yourself . I’m a rabbi and writer. I serve as Rabbi-in-Residence for Avodah, a fantastic org that trains young Jews for lifelong work in social justice. I wasn’t very Jewishly engaged growing up–we’d go to synagogue once or twice a year. Towards the end of college and in the years following, an interest in spirituality and philosophy landed me deep into a love affair with Judaism–I realized the ways in which the Torah could illuminate the messy gorgeousness of our lives, how serious spiritual practice could affect profound personal and social transformation, how this would could help turn us into people who were better of service to others and the world. So here I am. I wrote a book about the long, winding journey from atheism to the rabbinate, Surprised by God, and when I had kids, I realized that the deep wisdom of my tradition only half-prepared me for the chaos and tenderness of parenting. The great minds of the last many centuries, both in Judaism and in other spiritual traditions, developed some important tools to help us better experience awe and wonder, navigate ugly feelings and really see another person on their terms–but, mostly, Buber and Maimonides didn’t think to explicitly connect their ideas to the day-to-day work of parenting. Because it wasn’t on their radar! Someone, somewhere else, was managing tantrums and soothing a scared kid back to bed after a nightmare. As such, there’s also a lot of powerful wisdom that parents have to teach spiritual traditions about what the sacred and spirituality even is, and can be. That’s how Nurture the Wow was born–I was feeling adrift as both a mother and a rabbi, and I went looking for answers. In the end, I had to build bridges between the tradition and the lived experiences of parents in the trenches, because there really weren’t any. What are the struggles that Jewish women experience when they become mothers? I think the struggles that Jewish women today face are the same struggles that most mothers face. A lot of things get thrown into a blender when we have kids—our logistics, our finances, our priorities, probably our sanity a little bit. And for most of us, our identity—our very sense of selfhood—also gets taken for a spin. You know? Suddenly what you want and what you need gets put on the back burner, and who you are and have been in the world shifts dramatically. The baby’s hunger at 2am takes priority over your exhaustion. Her 7:30pm bedtime means that you’re probably going to say no to that night out with friends (at least most of the time, given what hiring a babysitter costs these days). Your love of travel, if you have the privilege to enjoy things like that, is at odds with the fact that your vacation days now cover the times when daycare is closed. Even your most basic needs become deprioritized; after Yonatan was born, I discovered that I could go a lot longer without peeing than I ever had before. I was so busy soothing, feeding, changing and getting him to sleep that answering nature’s call was often, well, pretty far down the list. Simply put, when you become a parent, so often, it’s not all about you anymore. Or hardly at all. It’s very disorienting, and we need both conceptual tools and a great, supportive community in order to re-ground. And even so–who we are on the other side, when things stop spinning, winds up being very different than who we were before. Can Jewish spirituality help them soothe these struggles? Absolutely. That’s really the thesis of Nurture the Wow–that there are lenses that can help transform and help us make sense of how we experience the difficult and beautiful, the confusing and infuriating aspects of parenting. Sometimes it’s about thinking about the idea of teshuvah–usually translated as “repentance,” but it’s really a way of returning to who we’re meant to be–as a way of making amends when we don’t act like the parents we hope to be. Sometimes it’s about going deep into the idea of I-Thou, Martin Buber’s brilliant framework for encountering another person in their wholeness and fullness. Sometimes it’s about using Jewish liturgy that can radically re-frame how we think about the body, or to help us name the ways we experience power and powerlessness. I could keep going…. Does parenting get in the way of spirituality or does it make room for a different type of spiritual experience? We have this narrative around “spirituality,” that it’s this thing that we experience in the quiet, or in solitude–hour-long meditations or whatever. I had that narrative, too, when I became a mom, and that’s part of what was so jarring–as though you can enjoy an unbroken hour of anything when you’ve got a baby! Jewish law says you’re not supposed to interrupt the central prayer of the liturgy for anything–even if a snake is crawling up your leg, you’re supposed to keep going. So it took me some time to get that there was this other, deeply profound thing happening at the same time, in my heart and in my relationship with my kid. It took a while to make room for something more free-flowing, but no less transformative, to enter my practice–a spontaneous prayer offered up when I felt stressed and at my wits’ end or overflowing with gratitude, prayers whispered into my kids’ ears, lullaby as prayer, prayer as lullaby, meditation and connection happening with and through my children, not separate from them. A spiritual expression big enough to hold play and laughter and chaos and tears and all of it. What are some ideas about Jewish parenting that you can share with us? Here’s one that resonates with a lot of people: The 20th century theologian Rabbi Abraham Joshua Heschel writes often about “radical amazement,” that sense of “wow” about the world, as the root of spirituality. It’s the kind of thing that people often experience in nature, for example, on the proverbial mountaintop. But not only that–a lot of it is about bringing that sense of awe into the little things we often take for granted, or consider part of the background of our lives. This includes not only flowers on the side of the road, the taste of ice cream in our mouths, or how groovy it is to use a straw, but also things we generally don’t even think of as pleasures, like the warm soapy water on our hands as we wash dishes. Obviously, radical amazement isn’t only for kids (though they do it really, really well). It’s about bringing that wonder, that wow-ness, to as much of the mundane as possible–to the dishwashing, to the gorgeousness of the tomato we’re about to slice, and, of course, to the tushies and toes of the cuddly, sticky, demanding children we so love. Ever seen a 4 year-old agog with joy seeing a bunch of ants crawling on the sidewalk? That’s radical amazement. The great thing is that our kids can be our teachers–and remind us to see those ants with the same kind of wonder and awe. Ants are pretty cool. When was the last time you stopped to really look at them? How do you define spiritual practice? Spiritual practice is an ongoing, repeated activity that, performed with intentionality, can transform how we understand ourselves, others, the world around us, and our place in the world. It is (if this language resonates with you) our connection to the sacred, the universe, and/or God. There are a lot of things we talk about as spiritual practice these days—prayer, meditation, painting, writing, yoga, hiking, running, and more. One of the questions I tackle in Nurture the Wow is, what if engaging in the intimate care of our children was understood as a legitimate path to understanding the universe, the transcendent, and our place in it? What if parenting itself was a spiritual practice? When we care for our children, we can go so far into love that we might find infinity on the other side; we can use the boring and the hard moments to pop us open; we can find new means of experiencing our bodies; we can open the doors of perception in immersive play; and even find within the depth and intensity of these bonds something akin to the mystic. We experience transcendent love in a million decidedly, non-transcendent moments every single day. If we go deep enough into our parenting, it can take us everywhere. How have you incorporated kabbalah (Jewish mysticism) into your life? Not really. Kabbalah is just a particular philosophical and theological outlook on Jewish practice. It was never meant to be a distinct set of practices independent of keeping Shabbat, keeping kosher, prayer, blessings, and the other things that under-gird the daily integration of Jewish spirituality into one’s life. And kabbalah isn’t the only expression of Jewish mysticism, either! The “basic” expression of Jewish practice is sometimes described as “normal mysticism”, a way of experiencing the mundane world as suffused with holiness. My own way of thinking about practice is actually much more Maimonidean–we don’t engage in spiritual practice to impact God, but, rather, to transform ourselves. That should be enough, shouldn’t it? Your turn: What are some of your main takeaways from what Rabbi Danya Ruttenberg shared? In the comments, tell me what made an impression on you, and how you might consider integrating some of her ideas into your parenting rhythm. Next What’s In Your Pantry, Yael Trusch?